Sometimes finishing well looks different than you think it does. You don’t have to be everything to everyone to finish well. You don’t have to do it all and then some to be counted among the greats. You don’t have to travel far and wide or spread yourself thin to be valued. Finishing well has more to do with your character than your time, status or audience. Finishing well might mean that someone carries you across the finish line when you don’t have anything left to give. Finishing well might entail helping someone else break through the tape at the end of the race. You don’t have to be the best, look the best, or feel the best to be a champion in My Book. You might cross the finish line broken and bruised—like I did—but holding a victory that cannot be taken and does not spoil or fade (see 1 Peter 1:3-9). Sometimes finishing well is getting last place, just showing up, trying again and not giving up. My economy is so different than yours. I value the weak. I pass out awards to the banged-up. I fill up the empty. I lay down my life instead of exerting entitlement. Listen instead of sounding off. Pick others up instead of sprinting ahead. Finishing well looks different than you think. It’s not about applause but about attitude. It’s not about accolades but an ability to endure when no one is cheering. It’s not about advancement but about being faithful with what He has set before you. Sometimes it’s about resting, relenting and relinquishing. Sometimes it’s about giving in order to gain and conceding in order to conquer. Don’t give up. I go with You. I am for you. You can trust me to be strong in your weakness. I finished well. Follow My Lead. For more encouragement about being a finisher, view yesterday’s #MondayMessage video. If you’re new around here then you might not know that each month you’ll receive a special love letter to help you unwind in His Presence. 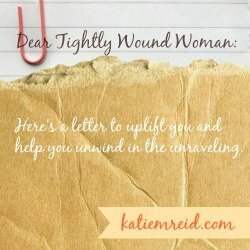 These letters (on the first Tuesday of each month) are written especially to the tightly wound woman who needs to be reminded that she is loved, seen and not alone. P.S. Join the #RaRaLinkup over on Kelly Balarie’s Purposeful Faith blog. I’m linking up over there with the rest of the cheer team as we uplift His name and encourage one another. I love this Katie! “It’s not about advancement but about being faithful with what He has set before you.” I so needed to hear this today. So glad to be your neighbor at #RaRaLinkup today. Sometimes hard to focus on God-promotion when we feel we’ve done something cool and want to share away… Looking for others approval instead of Jesus’. Literally learning this right now. Hi Dana: How are you feeling? I agree, it’s so easy to want the approval from others!